DAISY Pearce, from the Darebin Falcons, has etched her name in the AFL's history books, becoming the first No.1 pick in the inaugural women's draft. Fifty women from around Australia were selected in the draft at the MCG on Wednesday night, with the selections split between Melbourne and the Western Bulldogs. The drafted players will represent the Demons and Bulldogs in a curtain-raiser ahead of the clubs' women's round meeting on Saturday, June 29. It will be the first time AFL clubs have competed in an AFL-sanctioned women's match. A pre-draft toss of a coin saw Melbourne take the No.1 pick, and it selected Pearce, who was the first of 10 women chosen from the Victorian club. Pearce was moved to tears when accepting the Melbourne jumper in front of the crowd, and took a moment to compose herself before expressing her surprise and shock of being the No.1 pick. Stephanie Chiocci, from Diamond Creek, was the Bulldogs' first selection with pick two. The occasion was marked by AFL commissioner Linda Dessau announcing the top 10 players to the crowd and an audience around the country via an online stream. The selection process for the sides saw the names of nominated players circulated to state talent managers, who then made recommendations to the AFL clubs. Demons list manager Tim Harrington read the selections for his club, while Bulldogs recruiting manager Simon Dalrymple shared the duties with the team's coach, Peta Searle. 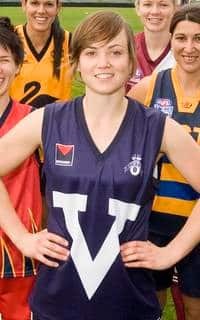 Searle, who is an assistant coach with VFL side Port Melbourne, is one of only two female coaches in Australia with level three accreditation and was named the 2011 All Australian women's coach. Michelle Cowan will take the reins for the Demons, having extensive coaching experience in Western Australia. In an interesting twist, Cowan will coach a player familiar with the Demons – Bronwyn Davey. Davey is the sister of Melbourne speedster Aaron Davey and Essendon's small forward Alwyn, with Bronwyn said to possess the same extreme pace of her brothers. The draft also celebrated the game being played by women across Australia, with draftees picked from Victoria, Western Australia, Queensland, New South Wales and South Australia.